. . . no small feet: Where do we keep the swim diapers? My kids were out of school a few days before my babysitting duties wrapped up for the summer. I agreed to take the tots to the local pool with my gang as a fun treat. The night before our end of year swim adventure, I texted the two moms and asked them to drop off swim gear for their kiddos. The next morning one of the dads showed up with a floatie device, a swim suit, and a diaper . . . he meant to grab a swim diaper but realized it was just a regular variety. Oops. Coach, who hadn't left for work yet, had a thought. 'Don't we still have swim diapers in a closet somewhere? Flotation device, bathing suit, and 'regular diaper' . . . uh oh. My mouth hung open. We haven't required a swim diaper in over 7 years. Did he really think that I had a couple of rogue swim diapers floating around in a closet somewhere? My house is rarely in perfect order . . . but, come on!!!! Give me SOME credit. I attack those closets on a regular basis. Last year I filled several garbage bags of clothes to donate to the less fortunate. My mind hurts to consider how jammed up every space in our house would be if I failed to regularly toss out nonessential items . . . like swim diapers! I assured the dad that despite Coach's vote of confidence, I would not be able to scrounge up a swim diaper. He ran to the drug store and bought a pack. Coach and I typically have different approaches to organizing the house. If he can see the carpet in the family room, he considers his efforts a success. I prefer not to just plow a walking path through the room. I'm all about putting things where they belong, and of course my ultimate goal is always: ELIMINATE. I often feel like what I do around here goes unnoticed. I have sensed that my efforts to run a tight ship are glossed over. Taken for granted. Coach's swim diaper comment confirmed that for me. Do you have a spouse who doesn't know where you keep things, or assumes you own things that have been tossed out ions ago? Do tell. This made me laugh, because -- even though we haven't needed them in two years -- I think I still have some swim diapers in my daughter's closet... and I definitely have one in my car. 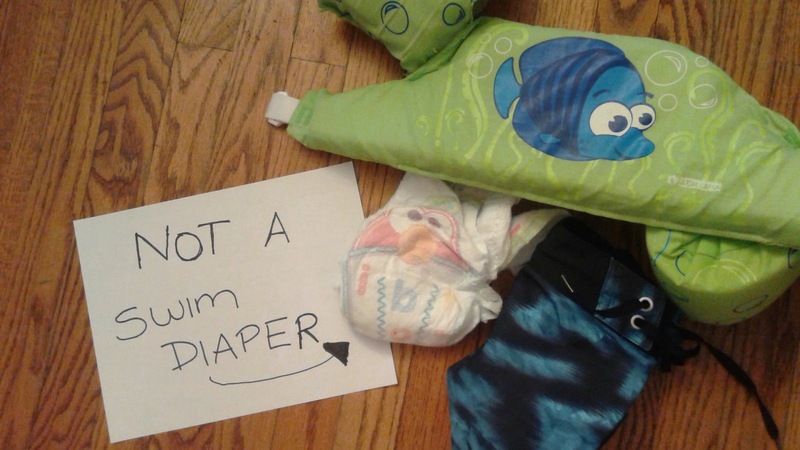 In fact, I just threw out my "emergency" swim diaper a couple of weeks ago! But my "you never know when something will come in handy" outlook is going to lead to a house full of junk, so I need to do more of the tossing and less of the keeping!